Faith Freedom International • View topic - Role Models To young Muslimah_ so what did they contribute? Role Models To young Muslimah_ so what did they contribute? Role Models To young Muslimah_so what did they contribute? Heba Amin Heba Amin was born and raised in Cairo, Egypt. She attended the Cairo American College where she was given an American education, at the expanse of alienating her from the society she grew up in. She moved to the US in 1998 to attend the Macalester College to major in Studio Art. She exhibited in group shows in Minneapolis, Washington DC and most recently in New York. .
Well all three appears to be undergraduates. Anyway let us find out from them who are these extraordinary Women in Islam? what is there contribution to Muslim Society, Muslim women and in general to women folks of this little planet., Let us find out and discuss this subject as this is Vital to Islam and vital to human race.. 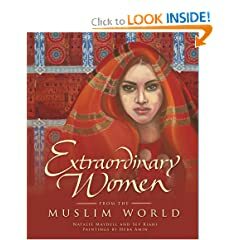 The objective of this book is to present an illustrative introduction to a select number of Muslim women who have lived extraordinary lives and gone to influence their communities in a positive way[/color], often overcoming extreme hardship and inaccurate stereotypes that have often been placed on the role of women in Islam. The list of women in this book is in no way comprehensive or exhaustive. Nor is the book meant to be an academic study of their lives or a guide to what makes a good Muslim, per se. ..
good.. good ., but who are they?? After that I will choose my own list.. So let us start a new thread on this..
Last edited by yeezevee on Wed Sep 09, 2009 1:24 pm, edited 1 time in total. Re: Role Models To young Muslimah_ so what did they contribute?